December 31, 2014 marks the 500th anniversary of the birth of one of the most important figures in the history of medicine. He authored one of the most elegant and influential books in scientific history. His investigations revolutionized our understanding of the interior of the human body and the methods physicians use to study and teach about it, reverberating throughout medicine down to the present day. His name was Andreas Vesalius. He was born into a medical family in what is now Belgium. As a boy he showed a great interest in the dissection of animals, a predilection that disgusted his contemporaries. Yet he persevered, going on to study medicine at both Paris and Padua, then two of the great centers for anatomic research. When he graduated, he was immediately offered a teaching position. Unlike those who taught him, he insisted on performing the dissections himself and encouraged his students to do likewise. Comparing what his dissections revealed with what he read in the textbooks of the day, Vesalius asserted that the flesh itself is a more reliable guide than the written word. He contradicted more than 200 of the teachings of perhaps the most towering figure in the history of anatomy, the 2nd century Roman physician and anatomist Galen. For example, Vesalius pointed out that Galen erred in asserting that the human jaw consists of two bones. How could a man whose teachings withstood the scrutiny of 1,300 years make such a seemingly elementary mistake? 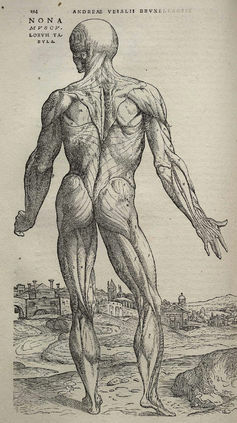 Some of the authorities of Vesalius’s day defended Galen by suggesting that the anatomy of the human body itself must have changed over the generations since. But Vesalius knew the real answer: Roman custom had prevented Galen from dissecting the bodies of humans, forcing him to rely on those of other creatures, such as pigs, apes and dogs. And when it came to the jaw of a dog, Galen was right. 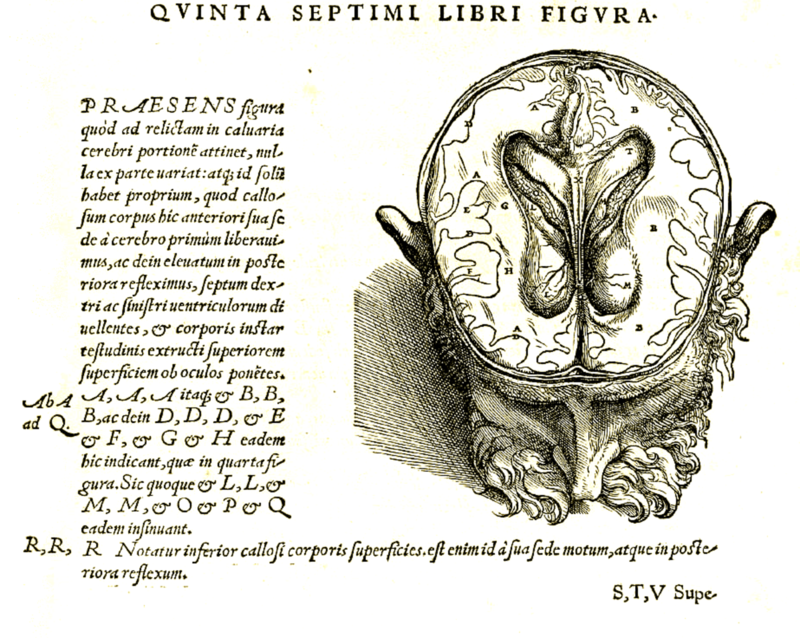 Of course, Vesalius himself knew that Galen was far more often right than he was wrong, and he frequently marveled at the depth of his ancient predecessor’s knowledge. For example, Galen had experimented on the spinal cords of pigs, demonstrating that when he cut the cord near the tail end, the animal first lost the use of its hind limbs. When another cut was made closer to the head, the forelimbs ceased moving. And when he cut still higher, the animal would cease breathing – a truly extraordinary experimental linkage of neurological structure and function. In insisting that teachers and students study anatomy directly instead of memorizing what they found in the textbooks, Vesalius was in a sense rekindling the flames of Galen’s own passion for direct observation. But he was also elevating them to levels not equaled for well over a millennium. In the process, he was creating truly remarkable anatomic specimens. His 1543 public dissection of a famous criminal’s body produced the world’s oldest surviving complete anatomic skeleton. It’s still on display today in Basel, Switzerland. 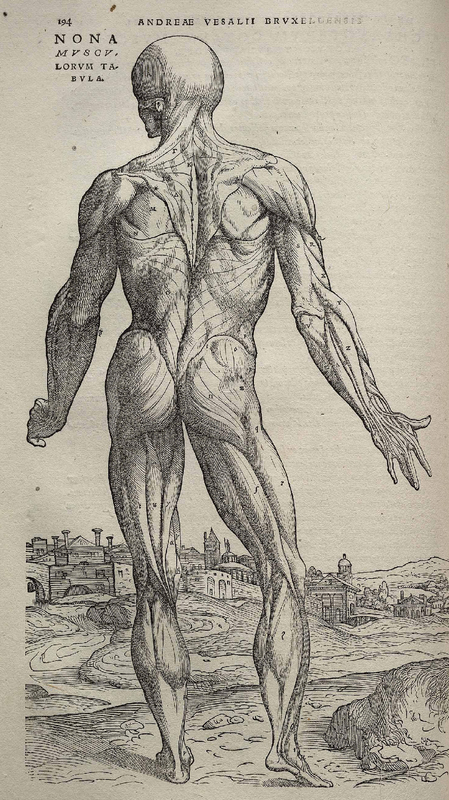 Perhaps Vesalius’s most remarkable achievement of all was his publication, On the Fabric of the Human Body. It consists of seven volumes describing the bones, muscles, blood vessels, nerves, digestive system, heart, and brain. The works contains over 200 illustrations, many of which are recognized today as among the most exquisite anatomic images ever produced. Produced by artists he retained, the drawings were engraved on wood blocks for reproduction, and they represent a quantum leap beyond their predecessors in anatomic detail and sophistication. 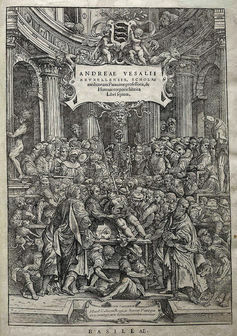 Vesalius’ masterpiece stands as one of the greatest books ever produced. It is simply beautiful, reflecting an unparalleled degree of both scientific erudition and aesthetic sensitivity. It showed the body not as inert flesh but enlivened and in motion, emphasizing the correlation of form and function. It also established vastly higher standards for anatomical research and teaching, setting biology and medicine on new paths of discovery. And finally, it is one of the greatest marriages of science, art, and humanism ever achieved. 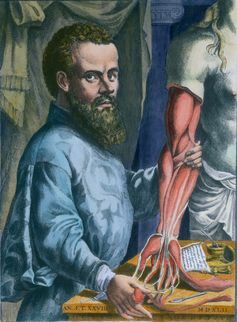 Equally impressive is the fact that Vesalius published his magnum opus at the incredibly young age of 28, in an era when most authorities in medicine were a generation or two his senior. But he was no enfant terrible. In presenting this new anatomic vision to the world, he was not so much tearing down idols as reestablishing the primacy of the human form itself as medicine’s most important text. Those who would know the human form, he said, must devote themselves to studying it for themselves, rather than delegating the responsibility to others. Our understanding of human anatomy has advanced quite far since Vesalius. The introduction of the microscope opened up a world of cells that Vesalius could scarcely have dreamt of, and the invention of CT and MRI scanners has made it possible to inspect the interior of the human form in life and without the use of a scalpel. Yet even these more recent innovations bear the spirit of Vesalius, who insisted that those who wish to understand the body must see it for themselves. This article has been updated to correct information about jaw bones in apes.